Apply the Dr Maynard Murray book, sea energy agriculture, to your farm. 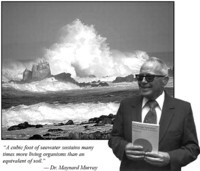 There is no doubt that Dr Maynard Murray was a great pioneer in the area of improving health through sea minerals. A small portion of his research work was recorded in the book, "Sea Energy Agriculture", and later, in the book "Fertility from the Ocean Deep". of the ocean, plus their tissue didn't show biological aging. This spurred him on to find the secret. The secret he found was sea minerals. Dr. Murray believes that rain, so necessary to our lives, is actually the cause of nutrient lack in our soils. Rain carries needed minerals out of our soils and to the oceans. Bring these minerals back to the land. In Dr Maynard Murray's first experiments he transported ocean water by the semi load, and sprayed it on the soil. The results were encouraging, but the transportation of ocean water was expensive. Next, Dr. Murray turned to experimenting with sea solids. He found that by fertilizing with sea solids, he was able to increase plant yields and decrease plant disease. When foods grown with sea minerals were fed to laboratory test animals, cancer, eye disease and hyper tension lessened or disappeared. When I read Dr. Murray's book, it filled me with a sense of joy. I immediately wanted to find ways to get sea minerals into the foods I eat. I spoke with Brad Becker of BreadBeckers, and for 2 years he fertilized some of his wheat with sea minerals. I bought some of the wheat, and used it for our bread. This was a good start, since wheat utilizes all 90 of the 90 naturally occurring elements in the ocean. I didn't have anywhere for a garden, and so became a bit frustrated. Then I learned that you can take a teaspoon a day of low sodium concentrated sea minerals. My wife and I began to do so immediately. We quickly found that the minerals eliminated our constipation, and were a great hydrate for sports. Although these minerals are readily available to our bodies, I knew that the best was of getting sea minerals is through our foods. We moved to a new house with a large back yard, and I finally could grow a large garden. The soil was poor, but I was able to make up for this with foliar applications of liquid low sodium sea minerals. After I made this video, I did see some insect damage as the plants aged. Sea minerals are a key component, but healthy soil also plays an important part. There are a number of sea mineral products on the market in the USA. I found that the sea solids that Dr. Murray used could pose a problem with soils already high in sodium, plus it was so expensive to apply them at the rates used by Dr. Murray. Liquid sea minerals were a way to get the wonderful results seen by Dr Maynard Murray for a much smaller amount of money! Please visit my home page, Healthy Vegetable Gardening. I wish you great success as you seek to raise nutrient dense foods.